If you hang around nursing home residents or ‘less young’ people even briefly, you’ll notice they don’t hide their opinions. When it comes to our more experienced and seasoned saints in the church, I suppose this could be good or bad, depending on whether their opinion is true or Biblical. Regardless, the deterioration of a speaking filter is a well-known side effect of aging. The older someone is, the quicker they get to the point, it seems. John the Apostle, who wrote the letter of 1 John when he was up in years, doesn’t waste time addressing his main point. Straight out of the gate, he discusses a topic that most shy away from in our day: whether or not someone who claims to be a Christian is actually a genuine Christian. We are living in the aftermath of a time in American Culture when it was beneficial to claim Christianity. Although this mentality is deteriorating (much like the speaking filter of the aged), the majority of the United States still claims to be loosely affiliated with Christianity. But what does that even mean? Is a loose affiliation with Christ all we need to gain eternal life? This ‘loose’ affiliation is concerning now, but it was also a concern directly after the death and resurrection of Christ. In fact, John writes his letter so that his readers can know they have eternal life (5:13). In other words, John doesn’t write his letter so that we can ‘hope’ that our affiliation will grant us eternal life…but that we can have assurance of salvation. Why? Because there is nothing more important than knowing where you will end up when you die. We can hope our stocks do well, our kids get scholarships, or that we finally get a raise at work… but knowing whether or not we will be in God’s presence or punished by Him forever is not something we want to have any margin for error. When we look at our own lives, or even the lives of others, we want to know if the claim of ‘Christian’ is true. This is the tension we see in 1 John 1:5-2:2 and–in his own blunt (yet loving) style–John tests three claims that people are tempted to make. We can say ‘we have fellowship with God’ and not live a holy life. John tests this claim that is all too common in our world. Most people claim a relationship with God. However John would tell us, ‘if we say we have fellowship with Him while we walk in darkness, we lie and do not practice the truth’ (v.6). This verse lets us know that claiming to be a Christian does not, in any way, make one a Christian. John goes further by saying that if you claim to have fellowship with God while you have a pattern of life not consistent with the God who is light (walk in darkness-v.5), you lie. If your mouth says you are Christian and your life says you are not a Christian, this passage tells us to believe your daily living instead of any claim you might make. Claims that have no action to back them up?…According to John, those claims would be FALSE. 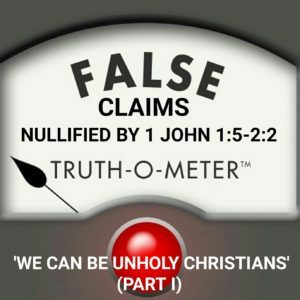 So, if one ought to live a holy life in order to verify their claim of knowing God, this passage leads us to ask the question, ‘Where are all the holy Christians?’. Our country (and our social media newsfeeds) would look like a vastly different place if all the people that claimed to know God actually did. Sadly, they don’t. The blanket that tucks them into bed at night is not knowing what God requires of their life. Ignorance is what covers them, lulling them to sleep. Similarly, people who go to sleep in a house with a carbon monoxide leak, don’t know it’s killing them. May God give them the grace to know He demands they turn from their sin, believe in Christ, and live a holy life before him. Maybe this is your alarm clock to wake up and turn to Christ, avoiding a slow death in darkness. If so, it’s not safe to hit the snooze button. The mark of a genuine Christian is their fellowship around the truth of the gospel with other believers, who also walk in the light–as God is light. This reminds us of the importance of assembling together with other Christians in weekly gatherings. If we are walking in the light, we will have natural desires to be in fellowship with one another, and the blood of Jesus cleanses us from all sin. By living Holy lives, we prove we know a Holy God. If that statement rings true for us, we have a desire to gather with God’s people, and we have a savior in Jesus who has washed away any stain of sin in our lives. Experiencing or witnessing this transformation does not bring to mind a ‘loose affiliation.’ Instead, we are left with the image of a 100%, sold-out, deeply driven, passionate dedication to Christ and His Word that even the most unfiltered senior would attest to.